Here is a recap of some of the summer outreach activities the McDevitt Robotics team has done in 2013. We started the summer with a visit to Boy Scout troop 1 from Christ Lutheran Church in Orland Pa. We showed the robot and talked extensively about the design process. The boy scouts were very interested in the robot and how it was build. Many scouts took a turn driving and we were very impressed by their questions. Special thanks to Paul Schlosser for arranging the visit. 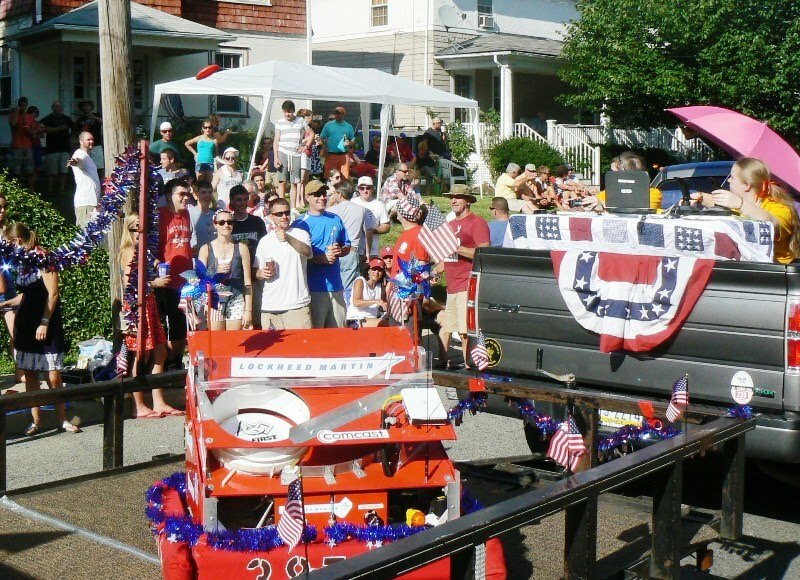 Next the robot appeared in the Glenside 4th of July parade. We took some lessons learned from last year and placed the robot in a trailer rather than driving it on the street. We consider this event a terrific way to show the community the great things going on at the school and we view this as an opportunity to give some public credit to our sponsors. Here we are shooting the red frizbee into a crowd of McDevitt Alumni. The drivers sat in the bed of a pickup and drove the robot around inside the trailer. To keep the robot’s special wheels from getting damaged we carpeted the trailer before the parade. All along the parade route kids asked us the “Shoot one a me”, but we had to keep the shoots in the street. Many kids wanted to keep the Frisbees and we only had 4. 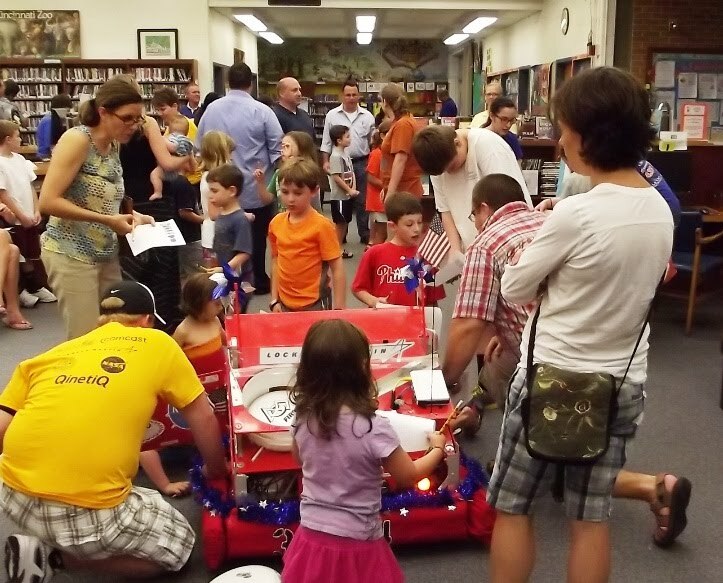 Next we visited the Springfield township Library for Robot Night. This was a joint event with our friends from team 433, the Firebirds. 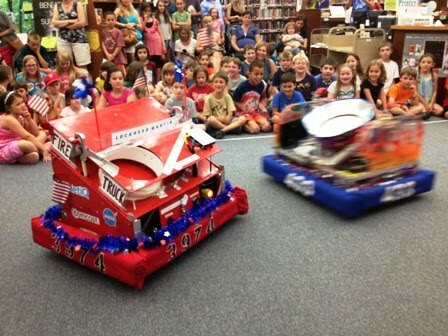 “Robot Night” is one the signature events of the Library’s summer program with many kids returning from year to year. Here the Firebird’s robot zooms over the smash into Firetruck while the kids watch. The event starts off with a “robot scavenger hunt” where kids search for various robot parts on 4 different robots. Then a demo is given before the kids get to take a turn at driving the robot. We had to dial down the power on the Frisbee shooter to make sure we did not knock our any ceiling tiles. Here is what the children’s librarian has to say after the event. We wrapped up our summer with at trip to the Elbow Lane day camp. This was a joint event with our friends from team 708, Hardwired Fusion. Here the robots battle on the basketball court. Here a future engineer gets some instruction on driving a robot. We are not quite done with showing off our robot yet. Early in the fall, when the University is back in session, we will be visiting our sponsor Arcadia for an afternoon showing off the robot to the students. We also plan to bring the robot at the annual alumni golf outing. If you have an idea for where the robot might be shown next, let me know. We will be competing in 2 fall events in Oct. Girlpower on Oct 12th is at Mount Saint Joseph Academy in Flourtown and Duel on the Delaware is in Salem Count NJ the following Sat. Oct 19th. We hope to see some of you there.